My Christmas projects are coming along nicely, and there's been so many little ones that I've not been able to keep up post-wise with it all. Here's a photo to give you an idea of where I am right now. I'm still working on my tiny toque Christmas ornaments for my family members back in Indiana, and I've got lots of gluing left to do to finish making all of the Christmas cards I plan to send this year. Admittedly I am sending out less this year than before, but I think that's because I have better contact with so many people now via Facebook instead. I am especially fond of the tiny toques. Not only because they're cute, but because they play a role in my 2nd annual Canadian Christmas tradition. Last year I was unable to go back home to the states for Christmas, so I made my family members a stuffed moose -- something that represents Canada -- to send in my place for hugging. I've decided to extend that, and this year I am making the tiny toque ornaments as my "Canadian item" of the season for family members. Last Christmas they got moose, this Christmas they will expand their vocabulary by learning about the wonderful word 'toque.' I plan to attach little vocabulary notecards to each ornament with the definition of a toque and its proper pronunciation and whatnot for fun ;) The big difference this year, though, is that we will be home for Christmas -- yay! Lucas and I are really looking forward to our Christmas trip to Indiana in a few weeks. The Calgary Festival of Crafts last weekend was a blast! 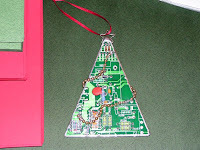 There were so many awesome crafty items to browse, and I even picked up a very unique item made here in Alberta... a Christmas tree ornament crafted from recycled computer parts! This is going to make a great gift. 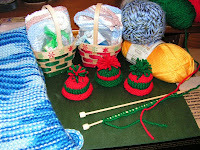 And speaking of gifts, I've added a few more things to my knitting to do list/works in progress. When I was at the craft fair, I got a really fun rubber-ducky-in-soap that I'd like to package together with a ducky washcloth for Somer. That means I need to make a ducky washcloth, lol. I'd also like to try my hand at making a second (and better) version of the plush knitted duck to go along with that. I still need to block the blanket for Lucas' mom, but I hope to get that done this weekend. And I learned that my cousin and his wife will be home for Christmas as well, and I'll finally get to meet their 4 month old son. If I have time, I'd love to whip up a cute baby Santa toque to give him when I meet him. I found a great pattern in Erika Knight's book, Simple Knits for Cherished Babies that I borrowed from the local library. Wish me luck!